Penny racers Made in Germany. 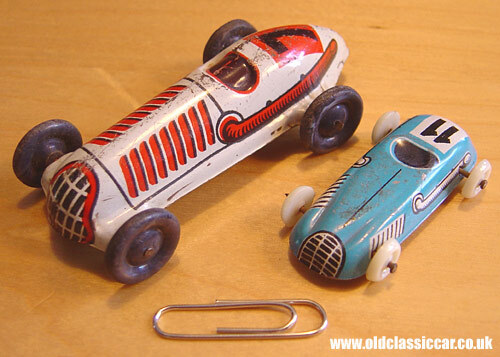 Two simple tin racing car toys. This type of toy, produced from the 1930s to the 1950s, would sometimes be referred to as a "penny toy", ie cheap to buy at a penny or so, or in the case of these two German toys, a pfennig. Both toy racing cars have lithographed pressed tin bodies, with no bases, and axles that project through the body itself. Neither is marked with a maker's name. The larger white toy has Made In Germany written in English on one side of it, probably dating it to the early 1950s. The smaller blue car is marked US Zone Germany, also indicating post-war manufacture. After the war, Germany was divided into four zones, one of which was under US rule. At this time, immediately after the war, German manufacturers were banned from exporting most products. Toys were an exception to this however, so long as they were marked up as being made in the US Zone Germany. This state of affairs lasted through to 1947, although these markings do still appear on later toys, as tooling was often used for many years in the making of toys.